I got another new pair of shoes today. It seems like I am buying these too regularly these days. This time it was due to two cosmic events happening at one time. Well, maybe not cosmic. Saturday I ran my final race in my current NB1222. Secondly, I happened to see a New Balance store in a strip mall when driving home from my race. Yes, this is November, 2008. I know that the 1222 and 1223 models have already been discontinued. But, that is the way I buy my shoes. 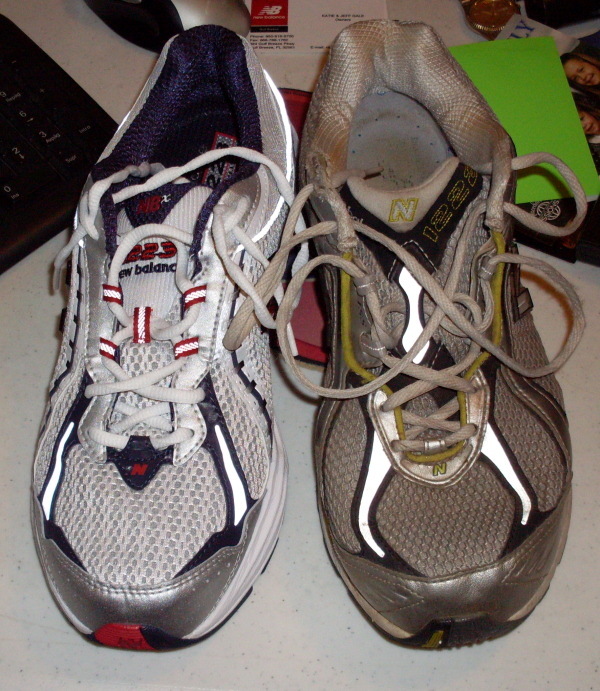 I find discontinued shoes in the models I would have bought anyway and get the older version on sale. Sometimes a crazy cheap sale. When I stopped at the shoe store on Saturday they did not have any 1223s in my size. They only had a few left since the 1224 model has been out for a short time. But, they did have 992s that they were clearing out for the new 993 model. The 993 shoes are not available in most stores yet. I checked a few places online that I have bought from before and they don’t have the 993 ready to ship. That line of shoe, 992/993, are the ugliest shoe that New Balance makes in my opinion. However, they are extremely popular. 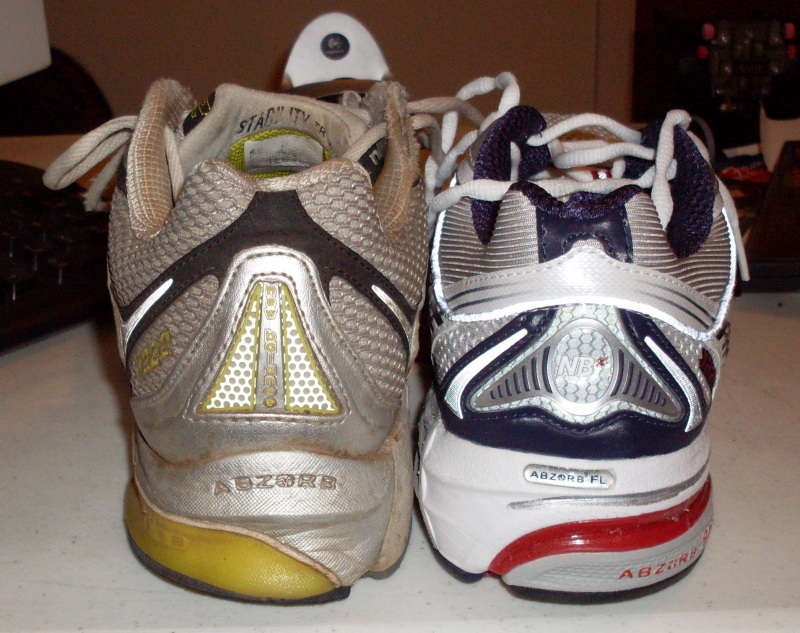 The older shoes have a memory foam that conforms to your foot and is supposed to be top of the line in comfort. The memory foam was heavy though and they tossed it out in the newer 993 to save weight. They are still a very heavy (and ugly) shoe. Weight and yuck factor don’t bother me as long as the price is right and they fit well. The price was right, but they did not fit well. I tried on several pair of the 992s in different widths and lengths. Nothing quite fit right. The one width/length combination that would probably be perfect had been bought out. Someone recently came in and bought all their 992 shoes in 11 4E in each of the 3 colors they had. I guess that is someone who really loves the shoe. Lamenting my situation, I asked the store owner to pull out what 1223 shoes they had that might fit. Surprisingly I landed on a size that is totally wrong, but it fit like a loose glove (I like my shoes big). She got me into an 11 2E shoe. These shoes were $140 regular price. I bought them for $59. I think that is the best shoe deal I have gotten so far. The 992 that I originally went in for was $69. So I got a shoe I like better, looks nicer, fits great and weighs less for $10 cheaper than I planned to spend. The interesting thing to me is how different the 1223s are from the 1222. In the pictures you see a 1222 (the dirty one) and the new 1223. They look nothing alike. Not as far as shoe models go. I am wondering how NB justified calling this an update when it is really a different shoe. Whatever the justification, it should still have the same basic properties. The store owner flagged my name with the fact that I want stability+ (or strong stability) shoes. In the future when they change models and start clearancing out the current ones, she should give me a call. That is service. I just hope I am home to be able to take advantage.